A question that often has been raised is whether the King James Bible really reflects all the meaning of the original languages. Does is say all it should? Are there particles of truth lost in translation? This book defending the AV 1611 answers the question of how the King James Bible resolves the ambiguity of the original languages. On a given Saturday, a Jehovah’s Witness (JW), dressed all dapper, and distinguished in bearing, approaches the front door of a house outside of a large Midwestern city, rings the bell and awaits opportunity to enlighten whatever soul opens the door to his version of the “truth” regarding the coming kingdom. His sidekick and visitation partner is there to observe how it is done. As happens only so often, the JW this particular morning does not encounter the mere vapid, religious zombie who only knows what he is supposed to believe, and not why. The doorbell is neither altogether ignored after a quick, flickering movement of the curtains, nor is it slammed shut in the middle of the JW’s oft-rehearsed spiel. Further, the prospective convert does not stand with glazed-over eyes, shuffling feet and wistful glances over his shoulder at the beckoning recliner and a ballgame that is about to start. No, instead of enduring further polite verbal skewering, the homeowner sallies forth and interrupts the JW elder’s post-introductory procession of words, by announcing himself a born-again, Bible-believing Christian. He further disrupts the flow by informing the visitors that since he already knows what they believe down at the Kingdom Hall, he might as well cut to the chase and say outright what the issues at hand are. He then relates that he has already fully investigated those matters, and there are reasons that he could never come to an agreement with such doctrine. He takes a short breath, giving the lead JW just a moment to adjust his tie and steal a glance at his now slightly wide-eyed partner-in-heresy. Unfortunately, the breath doesn’t take long enough to allow him to jump in and regain the initiative in the conversation. The Bible thumper proceeds to tell them that: 1) Hell is a real place that burns hot with God’s wrath even on this fine Saturday morning, that Pilate has been there for 2000 years in torment and that the folks in today’s obituaries are only beginning an eternal nightmare. 2) The Bible proves that Jesus Christ was literally God manifest in the flesh, quite unlike the JW idea, which was hatched by Origin and his buddies; and 3) Further, the blood of Christ shed for sinners was, thus, God’s very blood; and only the blood of Jesus Christ…cleanseth us from all sin – and that completely by faith! His timing all ruined, and disinterested now in continuing pursuit of such a theologically hardened yet well fortified aggressor, the still distinguished Arian frankly concedes that it does appear unlikely that he and his visitation partner will ever be able to come to any real agreement with the homeowner. So being willing to courteously disengage, he only wishes to say that the Bible-quoting saint should be aware that a great deal of truth is to be found in the Greek originals which is not contained in the fundamentalist’s old outdated Bible. Naturally, it would be best if the born-again guy would come to some Kingdom Hall meetings to find out what the bible really says. The young college student was riding a spiritual wave unlike anything he had ever known. He had been saved in a little country Baptist church at 10-years-old, and that meant that he had been saved for something like 10 or 11 years, but the personal revival he was experiencing in college was something else altogether! His salvation experience with Christ had been genuine as a boy, but he had grown precious little spiritually, and had become as lethargic as most of the people around him. As he grew older he had become more preoccupied with the world - school, sports, girls, cars and college. Life had hit him like a cement truck in college. He had maintained a mostly conservative mindset, retaining at least some of his morals, but the misery of bad friends, a lack of real direction, and a sense of drifting and spiritual alienation had settled into his soul like the fog creeping across the creek-bottoms at dusk. Financial hardship, loneliness, lack of fulfillment and various circumstantial crises had brought him back to the realization of his manifold need for God. Life was too big to control and he had learned that there were unseen obstacles capable of sinking his ship. For this, he had returned to the Savior of his youth, had genuinely turned from the sins that attached themselves to him like life-sucking leeches, and had given his miseries and burdens back to the One who had already borne them anyway. The precious promises were now sweeter than anything he had ever tasted. He felt free, and there was a certainty of God’s plan for him, though he knew not where the path would lead. His part was to hold fast his hope and confidence, trust God, and do right. On his journey back to the Father, he had wandered into a big, contemporary Baptist church in his college town. He was directed to the college-age department, and lo and behold, at the front of the class was an Elijah teaching the Bible in a manner he had never experienced before. The emphasis was on each word of the old Book and it was terribly plain that the words taught and believed as they stood in the text carried a punch that would put an All-American fullback on his backside. On occasion the teacher would bring in preaching tapes that were unlike anything that young Baptist had ever heard. The reverb from those messages would leave his soul afire until all hours of the night. The young pastor had been in town for a few months, called to begin a new work. There was a drought of anything like a true Bible-believing Baptist church in the area, and there had been a good deal of success in making contact with folks committed to the King James Bible. Though the group was fairly diverse and would need some time and a steady hand to get them all on the same page, they all would have been categorized as extremely conservative Fundamentalists, and had all paid a certain price already in their advocacy of the old Book. The backdrop was a Sunday evening fellowship after the service, held in the home of one of the enthusiastic attendees. Around food and conversation, talk turned to a certain matter in the scriptures. The query came from a middle-aged man, an established pro-King James Fundamentalist who had been very committed to the new church for months, both spiritually and materially. The pastor was asked what his thoughts were on the matter, so he proceeded to quote several passages of scripture that related directly, pointed out another couple of parallels and types in the Bible, and outlined what the negative logical alternatives were if it were not as he deemed it. The response of the enthused Fundamental Baptist (who was so excited to finally be in a King James church where he would not have to worry about hearing the scriptures corrected from the pulpit anymore) was disappointing. “Well, I would sure like to find out what the sense of that scripture is in the original Hebrew,” he said. A young pastor embarking in starting a new Bible-believing work in a gospel-starved city received a call in response to a newspaper advertisement announcing the formation of the new Baptist church in town. The caller turned out to be another pastor from a few miles away who had seen the announcement. It turned out that both pastors were from the same native state, and the caller quickly stressed that he was a very strong King James man, and indeed, it turned out that his sending church was known for specific tracts and pamphlets that laid great stress on the AV 1611 and it’s supporting Greek and Hebrew texts. However, the chit-chat didn’t continue for long before it became obvious that the caller had something on his mind. The caller said he had a couple of questions to ask to determine whether the two men and their churches could count on having fellowship together. It only took a question or two for the new man in town to see where the caller had drawn the line of fellowship. In the end they probably agreed on 95% of everything, including doctrine, standards of separation and church polity, but the caller was firm that they must see eye to eye on this one singular matter. They discussed the relevant scriptural texts and tenets, could not really come to common ground on the subject and parted as gentlemen. Having given the caller his mailing address, the church planter received a package of literature a few days later, courtesy of the caller. All of the tracts and treatises in the mailing expanded on and expounded in detail the caller’s position. The recipient felt that much of the information was poorly evaluated, biblically speaking, and led to mostly preconceived conclusions. Most noteworthy in the packet, though, was an exposition on a certain biblical text (remember, these men believed and defended the same English Bible) claiming that a critical preposition had been mistranslated from the Textus Receptus into the KJV English, having led thousands of Baptist churches through the years into apostate doctrine. The caller and his pamphlet held that the preposition should be changed. Concerning the four separate incidents narrated above, it is important to make something plain. It should be noted that the incidents are neither hypothetical nor second-hand. I myself am the homeowner and the young college fellow in the first two stories, and the new church’s pastor in each of the final two. These events occurred at different waypoints in the last 25 years of my personal experience, and there are many other such encounters, but I have chosen these four for a reason. The Jehovah’s Witness out door-knocking was a lost man and could not be expected to have a lot of spiritual insight or discernment. The new Sunday School teacher (sent to replace the King James Bible-believing teacher) was an NIV user and had been, in effect, taught that bringing the wording of the Bible into question and offering his own fallen opinion was a noble and spiritual means of conducting God-honoring Bible study. He didn’t know it, of course, but he was practicing dynamic equivalence and stood in defiance of Revelation 22:18-19. The Bible-believing pastor with the doctrinal bee in his bonnet came from a background of defending the 1611 Authorized Version, and was sent out by a church that produced sheaves of information defending the text, translation, translators and tradition of that sacred volume. In the end, though, he and his circle of friends could not abide leaving the English as it stood because his doctrine required that the scriptures say something other than what they actually said and, incidentally, what they still do say! The Jehovah’s Witness was a real guy, just a regular fellow who happened to have staked his eternal claim in the wrong religious outfit. For the purposes here discussed, though, he represents an entire category of person as well. He is a lost man though he has a bible, a proponent of the Arian heresy, and a cult member. The text family of his New World Translation comes from Egypt, specifically Alexandria. The Greek text of his bible was grossly mutilated and corrupted by an apostate genius named Adamantius Origen back in the 200’s AD1, and Origen’s adoring successors enthusiastically continued his work thereafter. The JW is an unregenerate man and represents a category of unregenerate man, which reads, studies and quotes a bible that is corrupt. He has a bible that comes from the wrong text! He further has the wrong philosophy about that bible. He believes, along with his church, that the scriptures are not inviolable and precise, but that the words are to be wrested, manipulated, and altered so that the people get the message, though they could never have the very words of the Living God. He is eternally lost and he has both the wrong text and the wrong philosophy about that text. The replacement Sunday School teacher discussed is a saved man. Mainline Christian bible studies are led by an army of men and women just like him. He has a stack of new versions and a library of reference books, or failing that, a computer bible program with all the reference works a soul could want, right at his fingertips. In all his devotional reading and in all his training – formal or informal – he has been led and encouraged by example to view the new translations of the Bible as wonderful and enlightening developments. He does not realize that the new versions he so giddily quotes are rooted in the same degenerate Greek text as the Jehovah’s Witness’s bible, and further that his favorite English translations of that text reflect nearly all of the same perverted readings as the bible of those zealous, Arian heretics! The new Sunday School teacher is a saved man, he gives a good deal of time and effort to the Lord, and he loves God - but he, too, has the wrong text. That corrupt text follows in company with the wrong philosophy about the Bible, as well. None of the translators of any of his new versions held sacred the specificity of wording. Indeed, they all did their work knowing that there had to be enough changes in the English text of each new translation to justify a copyright for their work. They felt free to manipulate and recast the wording in the word of God! Wrong philosophy! The Sunday School bible study leader is a regenerated and decent man who has the same wrong text and the same wrong philosophy as the JW. The enthused church member so pleased to have a part in starting an Independent, Fundamental, King James-Only Baptist Church from scratch, is the type of person who has been the backbone of conservative Christianity for a long time. He is often old enough to have vivid and living memories of some of the legendary preachers of the past – Roloff, Norris, Rawlings, Rice, Hutson and Hyles. He feels a connection, a unity of spirit, with a generation of Christians that extends much further back in time. He understands that the old and good way (Jer. 6:16) has somehow been betrayed and sold out in the most recent generations. He has seen the fruits of the church’s music sliding into Jazz and Blues rhythms, of down-spiraling standards of behavior and dress, and of preaching that somehow seems to contain more thunder than lightning. Naturally, he can see with perfect clarity that having six or seven different versions of the Bible dispersed in the congregation leads to confusion; that the heady Dr. Pastor’s big game safaris into his Greek lexicon, his translational preferences, and his calisthenics in grammar are killing sheep. If he ever had concerns about the scriptures of his fathers, Edward Hills, David Otis Fuller and J.J. Ray set him straight. The foundation for his Bible is a far cry from Alexandria, Egypt, and Origen never put his grimy, apostate pen to the Antiochian text! No, this Fundamentalist’s copy of the scriptures is founded on more than 95% of all New Testament readings, the text of the Montanists, Cathari, Waldensians, the Reformers and the Anabaptists. He has the OLD Book and the OLD Faith! God bless them, the old-time men grounded in the old way assured that this old-fashioned Christian would endure Laodicea with the right text! Alas, some traits of fallen human nature are hard to put away for good, and as moths to light, men are drawn to the wisdom of this world. The mantle and fraternity of scholarship appeals to the intellectual pride of the academic, and intimidates the rustic. The wise and scholarly are usually polarized to intellectualism and scholarship. The untitled tend to be insecure but deferential around the lofty heights of academia. The old powerhouse barnstormers trended toward acquiescence in certain degrees to high-minded scholarship, and the heady minds of Philadelphia-age Christianity had intellectual inclinations that left few unscathed by Alexandria. Their Antiochian text was undeniably right, but concessions were made to the wisdom of Egypt. That fine, Christian Independent Baptist had read the books, heard the sermons, and admired the men of God of old. He is saved, separated, eternally secure, has the right text, and the right Book in his native language, but he has been infected by the Egyptian tenet that there is a higher appeal! Finally, the preposition altering pastor represents the category of God-called men in the ministry with whom most all conservative Bible-grounded Christians would agree to the tune of 95+% on matters of Bible doctrine and church polity. Ministerial tone and timber vary a fair amount, but these men are better read than most, biblically, have most often been trained either formally or informally, have a burden for souls and godly things, and labor under the weighty burden of leading God’s people spiritually through this wilderness. There are varying degrees of extremity and zeal on various matters, but the category of men spoken of have openly publicized the positions of their churches and ministries as standing by the old King James. Certainly, there are those who have merely leapt on the bandwagon blindly or for the wrong reasons, as the tradition-bound always have. Mostly though, a King James man has become one for a reason. If he compared the translations, studied the textual evidence, read the history, and discovered Satan’s hand going back to Eden, then he knows he has chosen the right Greek and Hebrew text, and he knows he has the right Bible in English! But, the question to be asked is, does his English Bible - that blessed old AV 1611 - reflect all the meaning of the original languages? Does it say all it should? How about all it could? Does it communicate all that God would have us grasp? Are there particles of truth lost in translation? If so, did God see to it that these are mere unnecessary tidbits? If there are strands of necessary truth still entangled in that sieve of translation, dear God, what floodgates of distrust and uncertainty that must open! In this pastor, laboring in my local area, I almost had another friend in the ministry. We agreed on nearly everything. We had a lot in common including a God, a Savior, a Great Commission, and a high calling. We even defended the same Bible. For him, the fly in the ointment was a doctrinal preconception that led him to alter a lowly preposition. He found in the Greek the latitude for an alternative translation that English would not allow. For other men the motive very well could be different and might be to cover personal or institutional sin, hatred for authority, the love of money, bitterness, ambition, or it might reflect plain old academic gall. Nevertheless, we could not have agreed more on the right Greek and Hebrew text, he and I, but regarding the words of our lofty and noble English Bible, he had another authority and a higher appeal. He was in agreement with the cult member and the new translation junky, that the King James English was wrong. Brothers and sisters in Christ, there is a truth so true that it is now a cliché. That truth is that no two Christians will agree about absolutely 100% on everything. This little tenet can be used as an excuse and a justification for all manner of things; however the truth of the statement revolves around a whole bevy of variables like growth, maturity, lessons either learned or disregarded, poor training, good training, discipline, character, experience and study. I believe that honest, believing and enduring Bible study leads us much nearer the 100% agreement threshold than rabble-rousers and excuse-makers care to acknowledge. This I will say: It is expected that “Christians” will have a difficult time agreeing 100% on all the Bible means or teaches. Such noble men as Paul and Barnabas came to an hour where they had a divisive disagreement on the proper scriptural course to take in the matter of John Mark (Acts 15:37-39). I do not know many Christians who expect their friends and fellow-soldiers to be in complete and unwavering agreement with them about absolutely everything. If it is expected that we may not agree perfectly about everything the Bible means, let me just say that it is a disgrace for Bible-believers to not agree 100% on what the Bible says. There is no point in talking about what it means if we cannot agree on what it says. The brainwashed and unregenerate cult member said the old English Bible was just plain wrong. The new generation of Sunday School teacher blithely ricocheted from one new version to the next, quite sure that what he “preferred” was better than the old “King Jimmy”. The Fundamental Bible-believing church member did not think the AV was wrong. He just thought it was shallow or not expansive enough. The “Bible-believing” pastor needed the text of his Bible to say something it did not in order that it might support his doctrinal preconceptions, so he opted for the charge that it was unreliable or inadequate in some of its translation. Is the King James Bible wrong…even in a few places? Please do not be allured into a quizzical game of semantics with the word wrong. If it misleads, gives the incorrect sense or withholds a crucial truth, then it is indeed wrong. Is it unreliable, untrustworthy, shallow, inadequate, or questionable somehow, sometimes, or in some places? If one can interchange, substitute, or offer other more preferable words or more accurate words, then that must reflect something of a shortfall, does it not? Such an exercise in editing and altering speaks a great deal of the editor’s attitude about the quality of work that either God or man (or both) accomplished in the translation of the AV 1611. Was it merely man that achieved that lofty standard of scripture and literature which has served so well for 400 years, and if not, what part did the Lord have in it? Did He guide the translators? Could He have inclined them to a certain form of wording? Did He ever over-rule them, illuminate their understanding, lead them, dissuade or persuade them? Would He do so? Whom has God appointed as keepers of the words of God? To whom, if anyone, and by what decree, if any, has God given the latitude, the authority, to sit in judgment of the word choices, phraseology, and precision of the word of God? Surely a line must be drawn somewhere. If there is no such line, then anyone can claim the mantle. If there is such a delineation, then there must be some well-marked boundary or event in human affairs that serves notice that further meddling risks trespass into sanctified and holy things. Is there a line? If I am a cult member, do I get to change the Bible? No? How about if I have access to all the classic reference works and am able to speak by the authority of some of those heady commentators of the past? Still no? What if I am saved, godly, educated, orthodox, conservative, separated, and a Fundamentalist? Do I then have credentials enough to be allowed to reword and rephrase the English Bible? Where does the madness end? Where does the authority of God’s Holy Word stand indivisible, insoluble, inflexible, unwavering, and adamant? Does it stand as such anywhere but in Heaven? Men need answers to these questions. Many would prefer the questions were not framed in such a manner, but the fact remains that we need answers to questions that are unpalatable to some. The indispensable need for those answers lies in the affirmed reality that an entire range of people sit either in open rejection of the words of God, at worst, or in uncertainty and confusion, at best. It is expected that cult members and the ungodly would reject the wording of our Bible, but it is obviously incongruous that King James Bible-defending Christians, pastors and scholars would do the same. A question that often has been raised is whether the King James Bible really reflects all the meaning of the original languages. Does is say all it should? Are there particles of truth lost in translation? 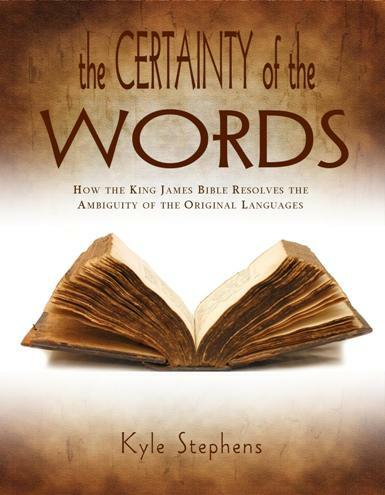 This book defending the AV 1611 answers the question of how the King James Bible resolves the ambiguity of the original languages.